It's impossible to review today's issue of Justice League without considering the not-insubstantial media firestorm that DC has cultivated around a scene at the end of the issue that features Superman and Wonder Woman pairing up. 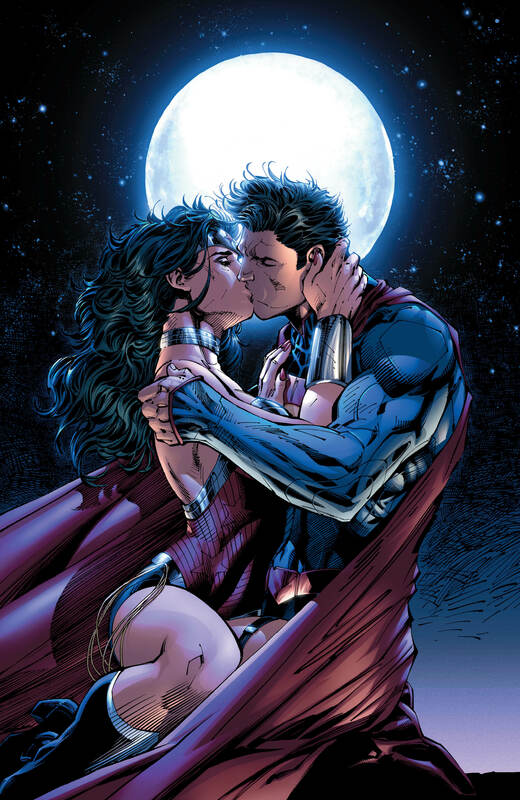 As a '90s Superman reader, I love a married Superman and have no real use for the novelty of coupling him with Wonder Woman just for a series of increasingly insipid Larry Niven jokes and to fulfill some kind of base fanboy fantasy that some writers so like to indulge, Justice League writer Geoff Johns often among them. That said, the scene in which they actually kiss is arguably the best, most believable scene in the story. In this rebooted universe, Superman and Wonder Woman are a couple of young people, and it's easy enough to see two young, attractive people connecting on the superficial level presented by Johns and falling into a physical relationship that could steamroll into something more. It also loads the formation of the Justice League of America with some new drama--not only will Steve Trevor be looking across the aisle, so to speak, at an ex-girlfriend who's clearly traded up, but just before she went to get all hot and heavy with Clark, Diana went to Trevor's hospital bed to fire him as the Justice League's government liaison. Anyone care to guess who will take his place? The Justice League International Annual certainly seems to point to a conflict between Trevor's ARGUS against a familiar face from Justice Leagues past. The "A" story, in which Graves uses his power to present the League with dead loved ones, feels like something that was done simply to bring the team to the point where they find themselves at the end and not necessarily a serious threat--especially because at times it feels like a minor league version of what Johns already wrote in Blackest Night, where physical manifestations of dead superheroes and their loved ones came back to haunt the living, providing a hard-to-fight force of zombies that destabilized the confident strut of DC's heroes. It's ably handled, but nothing about it seems particularly original or inspired. The emotional toll of the battle is more interesting, and at the same time a bit harder to stomach. A member leaves the League because he thinks they need a scapegoat to control public opinion following a fistfight they had while in the midst of battle? It all feels very early '90s Justice League International, but Johns doesn't have the same flair for characterization and dialogue that Keith Giffen and J.M. DeMatteis did, which means he sometimes finds himself writing the comic book equivalent of a big, dumb (but really fun!) action movie and trying to imbue it with emotion and wit that's simply not a part of his skillset. The character's departure actually works, except that it still feels forced, staged, and aimed at setting a new status quo for the League and that character, rather than the story you're reading being an end in and of itself. Virtually nothing in this issue feels particularly organic; it all seems as though it's simply characters going through the motions, knowing that by the time all is said and done, they need to end up somewhere. It's a problem common to many of Johns's "big" stories and a reason that books like Booster Gold and Aquaman tend to be the most enjoyable of his work, as they're usually allowed to stand mainly on their own.